Anti-Etanercept Antibody recognizes etanercept at the region of the fusion of p75 (TNFR2) with the Fc portion of human IgG1. 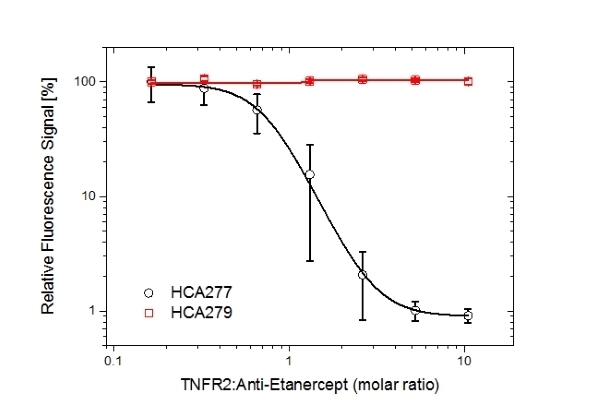 It binds to both free etanercept and to etanercept bound to TNF alpha, and may be used as a detection antibody in a bridging ELISA to measure total etanercept. Human anti etanercept, clone AbD26183_hIgG1 is an antibody that specifically recognizes etanercept at the region of the fusion of p75 with the Fc portion of human IgG1. 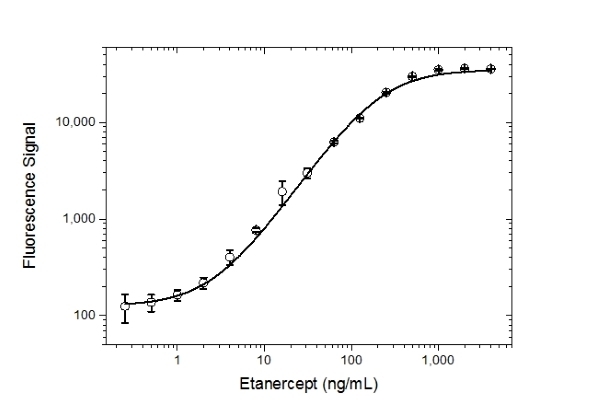 The antibody does not inhibit the binding of etanercept to its target tumor necrosis factor alpha (TNFα); it binds to both free etanercept and to etanercept bound to its target TNFα and can be used to measure total etanercept very specifically. The antibody can be used to develop a pharmacokinetic (PK) bridging assay to measure total drug in patient samples. This antibody, in full immunoglobulin format, is recommended as the detection antibody, paired with the antibody clone AbD25939 (HCA276) in monovalent Fab format, as the capture antibody. 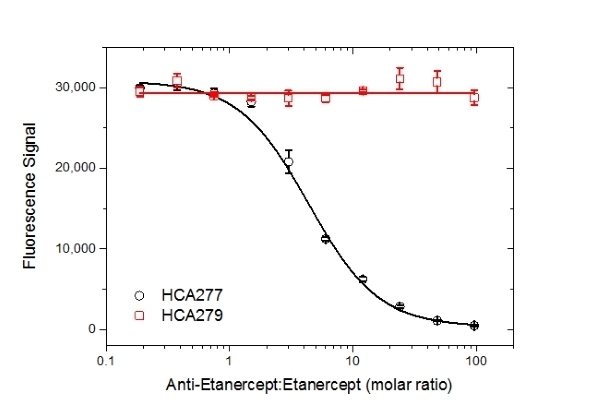 Etanercept (Enbrel®) is a dimeric fusion protein consisting of the extracellular ligand-binding portion of the human 75 kDa (p75) TNFR2 linked to the Fc portion of human IgG1. The Fc component of etanercept contains the CH2 domain, the CH3 domain and hinge region, but not the CH1 domain of IgG1. It is used to treat autoimmune diseases by interfering with TNF, acting as a TNF inhibitor. It binds to both TNFα and TNFβ (Lymphotoxin A). 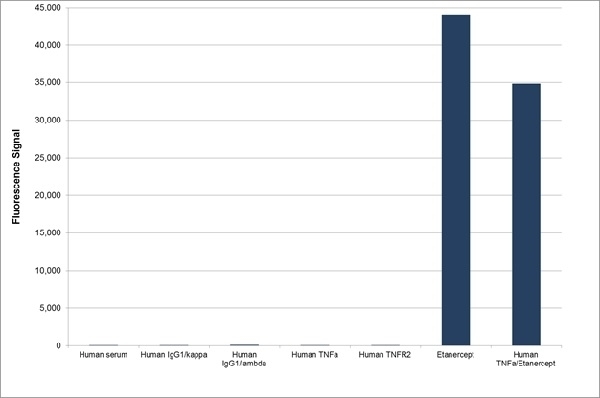 View a summary of all anti-etanercept antibodies. 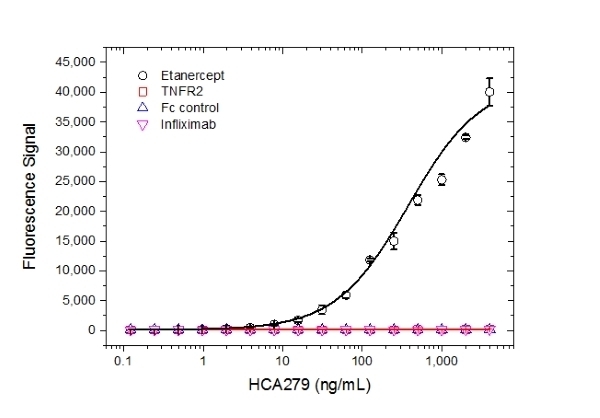 The monovalent intrinsic affinity of this antibody was measured as KD=14.8 nM by real time, label-free molecular interaction analysis on immobilized etanercept. This product may be used in a direct ELISA or as a detection antibody in a bridging ELISA. This product may be used in a direct or indirect ELISA or as a detection antibody in a bridging ELISA together with HCA276 as the capture reagent.